The Backyard Kitchen cookbooks were inspired by my grandmother Esther Cohen Salem who built a kitchen in the backyard garage of their Bensonhurst home. She and my grandfather, Selim, were the first to own a Syrian catering service in the Syrian Jewish Community in Bensonhurst, Brooklyn. A natural cook, Esther never measured, but used touch, taste and feel as her guide. Over the years, my grandmother's recipes were measured and directions were carefully written down. The series starts with Mediterranean Salads and Pickles. 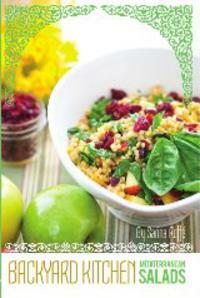 The book is perfect for beginners, the diet conscious, vegetarians and kosher cooks. I would like to thank design director Ruby Buckris, photographer Michelle Dayan and food stylist Elliot Chrem, for bringing this first cookbook to life.